In Tantra, the Anahata ("Unstruck Note") chakra is said to have twelve petals of a red or white hue, while the central part is a smokey colour. It is associated with the element or tattwa of Air, and is the seat of the Divine Soul or Higher Self, the Jivatman, represented by the image of a motionless golden lamp-flame. 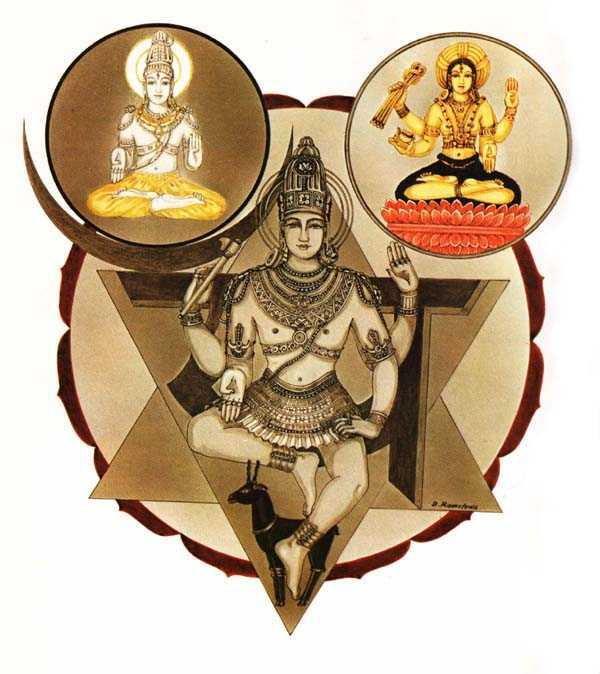 Deities within the Anahata Chakra. Table for Anahata Chakra 4. Astrologically, there is no doubt that this centre corresponds to the Sun (although Ann Ree Colton makes the strange association that it is linked with Venus, perhaps because she wishes to reserve the sun for the "Tenth Chakra" [Kundalini West, p.298]. Colton reflects her Christian bias by locating "Jesus" in this chakra; in fact it is more likely that the Jesus-impulse is accessed through the front Heart chakra, not the rear will centre. Rudolph Steiner however associates the Sphere of the Sun spiritually with the "Cosmic Christ" or "Spirit of Form"; the Divine principle behind the Human Christ, and cosmic and human evolution. In the Kabbalistic linear series of Sefirot, the Anahata/Sun Centre corresponds to the Sefirah of Tifaret, representing the first stage of the initiate or adept, in which one recieves revelation from one's Higher Self or "Holy Guardian Angel" (represented by Keter, the highest Sefirah). According to Tibetan Buddhism, the white, eight-petalled Heart centre is the meeting place of the Red and White Drops, and the seat of the "Very Subtle Mind" and "Very Subtle Wind (Chi)" that are immortal and pass from life-time to life-time [Clear Light of Bliss, p. ]; equivalent to Ann Ree Colton's heart "permanent atom" [The Third Music, p. ]. The Tibetans also describe this centre as the seat of the Dharmakaya or Buddha-nature Truth-body, which is of the essence of Absolute Reality (in Hindu thought, the equivalent term would be the Paramatman or Supreme Self). In Kabbalah, this Centre corresponds to Tifaret, located in the very Centre of the Tree, on the central pillar between Yesod and Daat. An alternate, Medieval Jewish represntation of the Tree has Tifaret connected by eight paths to the other sefirot [see left]; this recalls the eight spokes or petals of the Tibetan Heart-wheel. In Taoism, this centre is located at the top of the central "Thrusting Channel", and is identified with the heart and the "House of Fire". It is counterpole of the Lower Tan Tien or "House of Water", and the yogi is advised to shuttle the chi between these two centres, but not going above or below them [Taoist Yoga, pp. ]. Note that in Tibetan Buddhism (influenced no doubt by Indian Tantra) it is the Navel Centre (a little above the Lower Tan Tein) that constitutes the "Fire" Centre.